Whether you’re a chicken-keeping newbie or a veteran, ordering chicks can be an effective way to build your flock. Hatcheries located around the country have developed the art and science of hatching, sexing and shipping chicks safely to your door. Hatcheries are not perfect, though. Female chicks are more in demand than males, so a surplus of would-be roosters always exists. If you aim to raise meat birds and order either broilers or heritage birds from hatcheries, consider getting all roosters so you can raise them harmoniously together and give them a good life until harvest time. 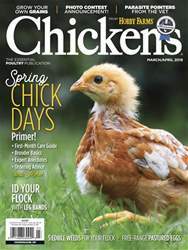 Most chicken-keepers, however, order female chicks to become laying hens for egg-producing flocks. This article is written with them in mind.